The Ajanta safety program is well-established, effective, and documented. 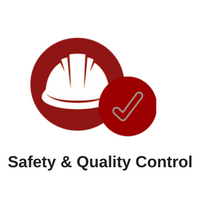 Employees are held accountable for specific safety program responsibilities assigned to them. Following all government and client safety requirements during each phase of every project is upheld by Ajanta’s Management Team as a priority. Our employees possess a wealth of experience working both in the field as well as working in diverse engineering disciplines. Extensive field experience allows Ajanta to design the safest industrial workplaces humanly possible. We consider the extensive field/operational expertise our employees bring to the table as one of the main factors that have contributed to our perfect safety record. In terms of quality control, Ajanta strives to exceed our clients’ expectations by building things right the first time. This is where top-notch engineering is often under-valued. Our philosophy is that when the pre-planning phases of a project are performed correctly, thoroughly, and with precision, then the rest of the phases of a project will naturally be completed with the same type of precision. This is how we deliver projects to clients on time and on-budget while eliminating the need for rework. Ajanta is committed to focusing on quality and excellence in every aspect of food processing machine project. We encourage employees to suggest new and innovative ideas for enhancing our existing processes and procedures. This is one way we continuously improve upon 35 years of experience designing and building industrial facilities.